The November WER report looks at the impact that the US election will have on oil and gas development and the extent to which deepwater will benefit or lose as a consequence of the incoming US administration policies. We also highlight the growing magnitude and competitiveness of US shale development -- which is increasingly threatening future deepwater capital spending – and identify the five floater projects next in line to become EPC contracts. 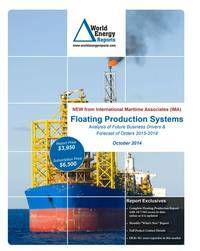 In the data section of the report are details for 198 floater projects in the planning stage, 51 production or storage floaters now on order, 284 floating production units currently in service and 25 production floaters available for redeployment contracts. Charts in the report update the location where floating production and storage systems are being planned, operating, being built and to be installed. Accompanying excel spreadsheets provide the report data in sortable format. Information is current as of 20 November.